This flavorful grilled chicken is coated with a sweet and sticky orange glaze made from honey, orange juice, rice vinegar, orange sauce, soy sauce, and spices. The weather here in Texas has been super hot, so we're been cooking outside quite a bit. Last week for dinner I wanted to try a new chicken recipe, but wasn't quite sure what to make? I remembered receiving a box of food product in the mail that it came with a few bottled sauces and seasoning items. You might remember a couple months back, I created a recipe for Grilled Balsamic Steak, Creamy Coconut Rice Pudding, and Ranch Vinaigrette Pasta Salad using food products new to Walmart. It's always exciting to open the sample boxes to see what items I received. Well for the month of July I received my third and final grocery bundle and was asked to review the products and create a recipe using my favorite items. 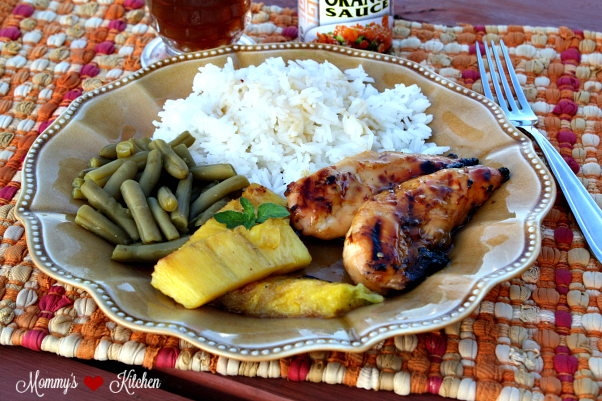 I used the Kikkoman Orange Sauce and the Marukan Rice Vinegar to create this deliciously easy sweet and sticky Honey Orange Glazed Chicken. I had several products to choose from, but I knew I could create a pretty good chicken recipe using both of those items. The following are a list of everything I received in my product bundle. I plan on making a seafood salad with the ocean adventures pasta and the Greek yogurt ranch dip. You can use chicken tenderloin pieces or boneless skinless chicken breasts for this recipe. 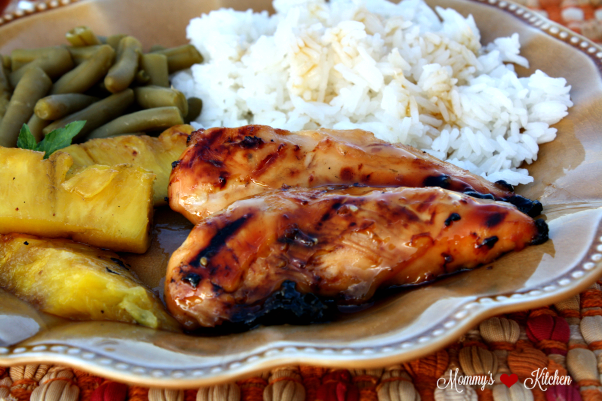 I served up my Grilled Honey Orange Chicken with Jasmine rice, green beans and fresh grilled pineapple (recipe below). 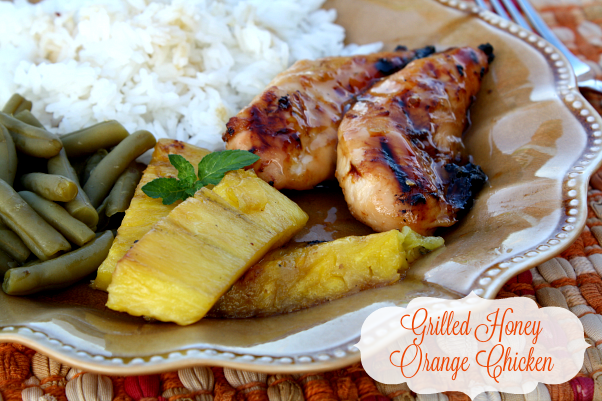 This grilled orange chicken was juicy and tender after being marinated in the flavorful honey-orange marinade. In a large resealable plastic bag, add chicken breasts or breast tenderloins. In a small bowl whisk together the, olive oil, Kikkoman orange sauce, orange juice, rice vinegar, soy sauce, simply Asian seasoning, and pepper. Reserve about a 1/2 cup of the marinade (refrigerate reserved marinade) and pour the remainder into the resealable plastic bag over the the chicken. Squeeze the bag until the marinade has coated all the chicken pieces. Refrigerate for at least 6 hours or overnight. Remove chicken from bag and discard the marinade. 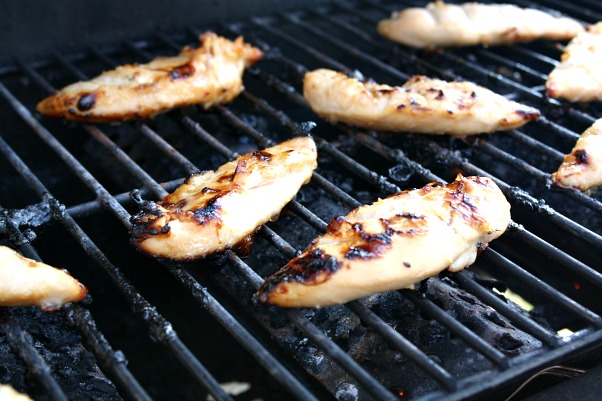 Grill the chicken pieces for about 10 - 15 minutes or until the juice run clear. Remove chicken from grill to a serving dish. Warm the reserved marinade and pour over chicken tenderloins before serving. Coat each slice of pineapple with brown sugar. Allow the pineapple to sit at room temperature until the sugar has dissolved a bit. Place the pineapple on a hot grill (in direct heat) for 5 - 10 minutes or until a bit of char has appeared. Flip the pineapple over and grill the other side for an additional 3-5 minutes. 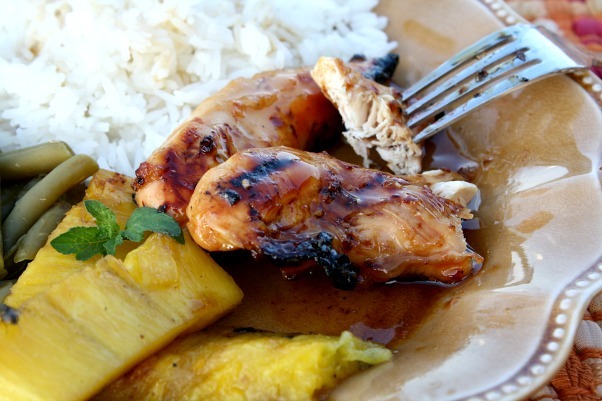 Remove from grill and drizzle the pineapple with honey or agave nectar before serving (optional). Ingredients to make this recipe as well as the new products can be found at Walmart stores nationwide. What a great recipe creation. It truly sounds like this dish would have a lot of flavor.